Illuminant: Petroleum Vapour burner for most of its history. Sambro Island light installed in 1906 and serving until 1967 when replaced by an airport type beacon. 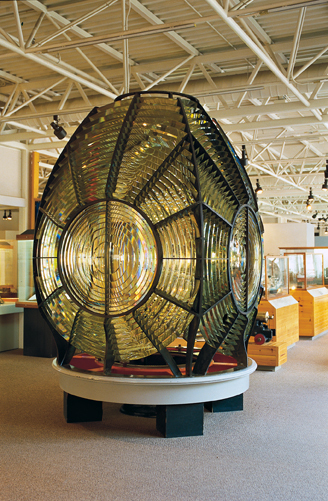 This first order Fresnel lens replaced earlier systems of lens and mirrors used on Sambro Island. The island marks the entrance to Halifax Harbour. A lighthouse was built on Sambro Island in 1759 and still remains in operation, the oldest operational lighthouse in North America. For more about the history of the Sambro Island lighthouse, see the Sambro web page of the Nova Scotia Lighthouse Preservation Society. Today the lens welcomes visitors inside the entrance to the Maritime Museum of the Atlantic.